Today's post is one that I never thought that I would actually write. But alas! Here I am about to tell you about my experience of getting tattooed for the first time. Before I begin I would just like to say that I know you're a friendly bunch here on GGMH but it's just worth noting that I am very happy with my choice of tattoo and the placing of it, I know that there can sometimes be a lot of negativity on the internet when it comes to tattoos and if it's not your thing then maybe the following post isn't one for you, and that's fine however, i'm not down for any serious negativity and if you don't like my tattoo or you don't like tattoos in general then please refrain from leaving a negative comment as it's rude and unnecessary. On the other hand, if you have any positive thoughts or questions feel free to ask away. As much as some people have a blase outlook when it comes to a tattoo, I am simply not one of those people. I put a lot of thought, research and planning into my piece because my mind simply wouldn't rest until I knew 100% that it was what I wanted. I spoke to my friends and family who already had maginificent pieces and I got a real sense of what the experience was going to be like, how to find a good artist and how to look after my piece once i'd had it done. I originally was going to get a tattoo on my foot when I turned 18 however, I didn't really know what I wanted so my Dad told me to wait until I was 20/21, when my body had stopped developing as quickly and I knew my adult self a little better. After putting my ink desires to bed for three years the right time recently came around. As you guys know I am currently living in London and I am truly having a blast. It occurred to me one day whilst strolling down the King's Road in Chelsea that I wanted to mark such a great time in my 20's and a time where I felt completely free and happy. I thought what better way to remember this time than to get a life long souvenir of when I felt like I really knew who Hollie was. 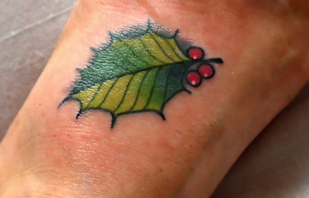 This is how the Holly Leaf came about, it is a symbol of me finding who I am and who I want to be. Some may say cheesy,but I can't find an alternative 'cooler' sounding reason. Holly trees are vibrant and colourful even in the stark winter months. They repel lightening and were often put around homes for protection from storms. Once I had decided what I wanted and where (I've only ever wanted a piece on my foot) it was time for me to find a studio and an artist. Being in London I had my pick of some fantastic places but after lots of research, reading lots of reviews and a personal recommendation I chose to be tattooed at Cloak and Dagger just off Brick Lane in Shoreditch. The next stage was choosing an artist to design and complete my piece, I looked at all the Cloak and Dagger artists work on Instagram and decided upon Jack Goks because I loved his neo traditional style and use of colour - it turned out that he was actually a friend of a friend from Leeds, which helped also. The next stage was to put down a deposit and book in! Due to the placing of my tattoo I needed time to rest it and not to be on my feet all day so I chose a weekend to have mine done, it is certainly something to think about as you want your piece to heal properly and safely. One day after the inking, my foot was swollen. Four days after the inking, the tattoo is in the healing phase, some little scabs have appeared and a protective 'film' has appeared over the top of the piece dulling it down the colours little. Once it has healed properly, the colours will be vibrant again. I was very nervous when I went into the shop, it was the feeling of not knowing how my body was going to react to the pain, everyone in there seemed so cool, calm and collected and there I was sweating cobs. I was advised by my friend to make sure I ate something before I went in and I also took some jelly babies and Coke to keep my sugars up just incase I felt light headed. 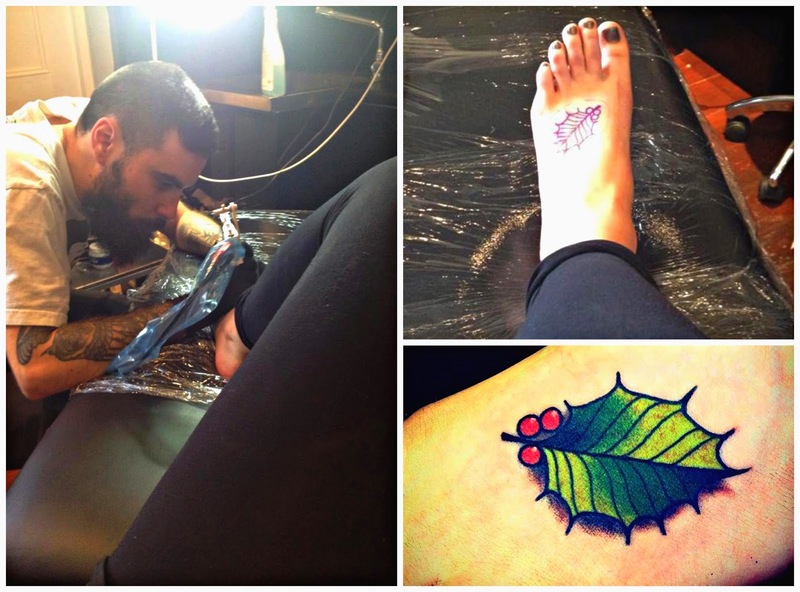 Jack quickly drew my leaf and applied the stencil, I sat on the bed with my foot up thinking oh my god i'm going to die. I was told that I had chosen a pretty hard place to be tattooed in terms of pain and it wasn't the easiest to sit through which made me feel even worse! As the equiptment began to buzz I turned away and bit down onto my fist, my god it hurt. I know you're all going to ask me what it feels like and it is one of those pains that as soon as you walk out of the shop you completely forget. The only way I can describe it is like a shard of glass piercing your skin in an intense stinging sensation. It makes you shake, it makes you grit your teeth and say: "Bloody Hell" but it is bearable and I am a massive wuss and I didn't cry or pass out. The artist stops every few seconds anyway to clean the area so everytime it starts to become super intense the pain stops and of course if you needed to you can ask to have a break. I think the worst part for me was the colouring as the scratches are quick and multiple, I certainly found that the berries near my toes hurt a lot more than the top of the leaf. The whole thing took around 30-35 minutes and Jack was fantastic, very efficient and kept the whole thing friendly and casual. I would definitely do it again especially after he told me I chose a bad place and took it very well. I won't go into the aftercare too deeply as you must listen to your specific artists instructions, I had to keep mine wrapped for three days, cleaning it and applying Bepanthan four times a day. On the day after my tattoo there was a little bit of swelling and the piece felt a bit tight and sore, a sensation like sunburn but nothing too major, I was hobbling a bit but otherwise all good in the hood. By five days after my inking, my foot was a little itchy as the skin healed but my walking was normal and there was no pain other than a little tenderness when I applied my cream. I am very pleased with the result and I can't stop looking at my foot! I hope that you found this helpful if you are waiting to be tattooed or thinking about it and if you want to ask my anything then feel free to leave a comment or email me, i'm not an expert but I was a first timer and I am now a convert!